It hardly seems possible, but the falling pine needles announce that fall is coming. My query is, where did summer go? I know that part of the disappearance is the fact that I am now working at a job that I love, and the time just seems to fly by. My working hours have taken over the lonely nights and weekends when I really felt the loss of my hubby the worst. Now I am busy greeting people, being a ham on the microphone, and generally helping patrons at the casino in anyway that I can. I find it most enjoyable to be able to talk to people; being home I only spoke with my pooch, who is a very good listener, but seldom makes comments. I have my mornings at home when I can catch up on doing things that have to be done, or doing nothing at all. That “”doing nothing at all” part is now done without any guilty feelings because I feel I have earned my rest. I also rest on my laurels, as I have been told by several different people at work that I am doing a great job. Isn’t it wonderful to hear that? I experienced something new this past week end, I watched the horse races! 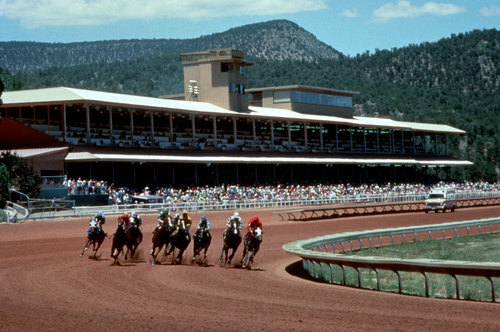 All these years in this beautiful pine country, and my hubby and I never went to the races. All the hoopla involved never enthused us enough to attend. Well, I ended up going in to work with two hours of anticipation, and decided to sit in on some races. They were quite exciting, and I can now see how people get so worked up over them. The fact that the purse was at a high of two and a quarter million dollars was nothing to sneeze at either. The time flew by also because I had a visit from my sister for the whole weekend. We spend a lot of time talking, laughing, and sometimes even crying, as we both shared our joys and our sorrows. It is another thing that I miss, having the nearness of kin, especially my sisters; we have always been very close. I had an episode at church on Sunday, when my nose started bleeding and I could not stop it. It took almost twenty minutes before it finally ended. Since I had been having them more frequently, I went to the doctor. You always imagine the worst, but it turned out that the membranes in my nostrils are swollen, and have hit some veins, which start the bleeding. A prescription for some nose drops and a suggestion that I have a humidifier by my bed at night seems to have solved the problem; I certainly hope so, it is kind of scary when you can’t stop the bleeding. So now it is time to prepare for fall and winter; as usual, I am probably the only person is this area who does not wish for snow. Since that is still a few months away, I will concentrate on enjoying the cool weather, and my viewings into Facebook where I see pictures of my great grand-daughter almost on a daily basis. This is such a wonderful way to keep in touch, I recommend it to everyone–GET ON FACEBOOK!!!! I have been reading, viewing, listening, and growing angrier by the minute, at the comments made by Republicans concerning the nomination of Sonia Sotomayor by President Obama for the post of Justice of the Supreme Court. Judge Sotomayor has drawn the ire of one of the loudest mouths of that party, Rush Limbaugh, who has called her a racist. Racist? This by the man whose picture appears in every dictionary next to that word? He who has positioned himself against blacks, browns, yellows, gays, native Americans, and every ethnic group outside his immediate group of elitists? Let’s see, Judge Sotomayor is an American, a woman, and a Hispanic, in that order. This last description is the key word to his ramblings, he is ignoring the fact that she has been an outstanding presence in the Judiciary for many years, a Court of Appeals Judge, nominated by President Bill Clinton. Even at that early date, Limbaugh was already calling her an “ultra liberal” who was on a “rocket ship” to the highest court. I would put her record, from humble beginning, against any person whom Limbaugh lauds. She was born in the Bronx, a borough of New York City. Her father was Puerto Rican, who came to the this country so his children would have a better life. Have you heard that before, in my writings? Sonia was diagnosed with diabetes at an early age. She has stated that at the age of 10, she decided she wanted to be an attorney, and worked her whole life towards that goal. She earned scholarships to both Princeton and Yale. The comment that she made and for which she has been called racist, was when she stated that as a Latina with modest beginnings, and a lifetime of experience, she would be better qualified than a while male with her qualifications. I strongly agree with her. Holy Sheet! The Republicans jumped on that ship and have been sailing high ever since. Notice that her comments had both “woman and Latina”, a red flag to ultra conservatives. How typical. They have said that they do not plan to filibuster her nomination, but knowing their methods, I am sure they will make every endeavor to make her life hell. They are not quite so stupid as to go against the growing Hispanic voters, but will make her nomination a very steep climb to that coveted Supreme Court spot. I hope they fail miserably. The above chord struck a note within me, it was resonant because several years ago legislation was passed by our neighboring country of Mexico that allows citizens born there to have dual citizenship. While I was not born in Mexico, my grandparents were. They left to find a better life in this country. I have no desire to have any other citizenship than that of the USA. My grandparents, if alive, would heartily agree. They left all that was familiar to them to establish themselves in a foreign land. Everything was strange to them–language, customs, etc. They foresaw that their children and grandchildren would have better lives in this land of opportunity. Not a day goes by that in my heart I thank them. I have no quarrel with those few individuals who have chosen to accept the offer and have that dual citizenship. We are a nation of immigrants, and unless you are Native Americans, your forefathers came from somewhere else. Then, why the intolerance of one race against another? Children are born without prejudice, it “Must be Carefully Taught”, as a song from the musical “South Pacific” states. They learn it at home, through the behavior, actions, and words of their parents. What a heavy burden to carry, to look in the mirror and face yourself, knowing you have fed into the minds of your innocent children, hatred and bigotry. I love the United States, complete with all its faults. I can think of no other country where I would care to live. I always get chills when I hear the “Star Spangled Banner”, and tears in my eyes when “America the Beautiful” is sung. My husband and I traveled to many foreign lands, and enjoyed every minute of it. We explored the different cultures, tasted a variety of food, tried communicating in different languages, joined in their celebrations and commiserated in their anguishes. We respected their customs and their laws. There is no greater feeling than that of returning to your own soil. A cloak of peace descends upon re-entering our country. Yes, there are prejudiced people who resent the fact that we speak Spanish; but there are also those who admire and even envy our ability to do so. Yes, there are people, who in fits of anger over dozens of undefined reasons, will tell us to “Go back where you came from”. I can proudly answer, I am where I came from; I am home. Welcome to my blog. I am Alicia R. Lopez of Ruidoso, New Mexico. I, for many years, wrote a weekly column for the El Paso Times. To all my readers and friends; I’ve missed you. Due to many circumstances, which I will not state, my column no longer appears in the newspaper, so I have taken this 21st century way of contacting all those who enjoyed my column, and even those who did not; and I did hear from you! I hope to write interesting things about current events, musings from my active mind, whimsical remembrances of my past, and even my hopes for the future. I hope you stay with me, and I want to hear from all of you, friends and foes alike. Please don’t disappoint me.